The United States shot down a Syrian regime SU-22 fighter-bomber jet Sunday evening after it dropped bombs near Syrian Democratic Forces (SDF) fighters south of Tabqah, Syria, about 30 miles from Raqqa. Coalition forces have been supporting the SDF and Syrian Arab Coalition (SAC) forces since they launched their offensive to recapture Raqqah—ISIS’s proclaimed capital—on June 6. This is the first time the United States has downed a Syrian jet since the start of the Syrian conflict in 2011. 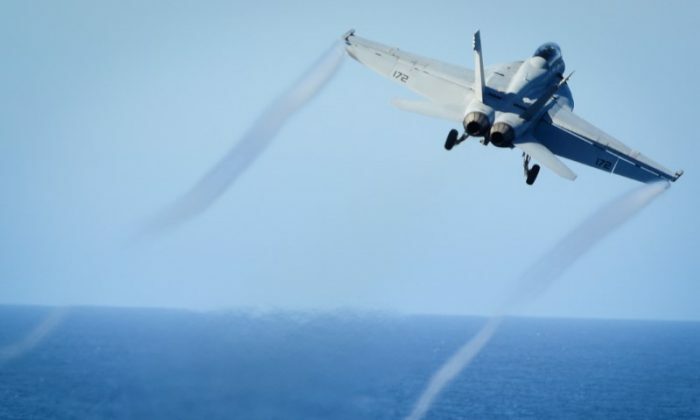 “In accordance with rules of engagement and in collective self-defense of coalition partnered forces [the Syrian jet] was immediately shot down by a U.S. F/A-18E Super Hornet aircraft,” reads a statement from the U.S. Department of Defense. “The coalition presence in Syria addresses the imminent threat ISIS in Syria poses globally. The demonstrated hostile intent and actions of pro-regime forces toward coalition and partner forces in Syria conducting legitimate counter-ISIS operations will not be tolerated,” it also said. U.S.-backed Syrian militias also threatened to retaliate if the attacks continue. “The regime’s forces have mounted large-scale attacks using planes, artillery, and tanks since June 17,” Syrian Democratic Forces spokesman Talal Selo said in a statement. Syrian attacks have targeted SDF areas near the town of Tabqa and the adjacent dam, said Selo. The alliance of Kurdish and Arab militias captured the dam from ISIS in May. The Kurdish-led SDF has been pushing into ISIS’s Raqqa base of operations with the help of airstrikes and special forces from the U.S.-led coalition. The offensive comes as Iraqi and coalition forces continue their nine-month siege on ISIS’s Iraq capital, Mosul. Knocking ISIS out of the two cities will do much to dispel the mystique of the group, Lt. Gen. Steve Townsend, commanding general of CJTF–OIR, said in a statement at the outset of the battle for Raqqa. The United States is playing a secondary role in the battle for Raqqa, an ‘advise and assist’ mission, providing “equipment, training, intelligence and logistics support, precision fires, and battlefield advice,” reads a statement earlier this month from the Combined Joint Task Force. The Syrian government has previously signaled it would not interfere in SDF’s Raqqa campaign, and would focus on the Deir al-Zor and the Badia region, south of Raqqa, as its military priorities. The recent Syrian regime attacks on SDF and SAC positions in the region have raised tensions between the regime and the multiethnic force fighting to reclaim Raqqa. “If the regime continues attacking our positions in Raqqa Province, we will be forced to retaliate … and defend our forces,” Selo said.